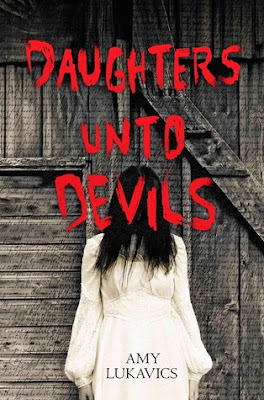 Once Upon A Teen Reader: What 10 words (or less) would you use to describe DAUGHTERS UNTO DEVILS? Amy Lukavics: Is she crazy, or is the prairie evil? OUATR: Unlike most other YA horror novels yours also falls into the historical fiction category, why did you set the book in pioneer times? AL: The time period and setting went well with the type of horror elements I wanted to incorporate, and helped contribute to the atmosphere as well. OUATR: What kind of research did you do for the book? AL: For research, I focused mostly on the more technical aspects, like which tools were used, food storage/preparation, and what techniques were preferred to build cabins or assemble covered wagons. OUATR: Amanda, the main character, is not only pregnant but she might also be going crazy. What was it like writing a character who may or may not actually be seeing things? AL: It was fun! When the truth isn't directly exposed, it leaves you with plenty of room to play. OUATR: With your debut just recently released what are you working on now? AL: I'm working hard on my follow-up novel to Daughters unto Devils, which is a standalone (so not a sequel to Daughters.) I'm so excited to be able to reveal more details about it soon! 1. On a scale of 1 to 10 how scary would you say your book is? I'll let the readers decide! 3. What is your favorite scary movie? It's hard to choose just one...there are several! But I really love the film adaptation of Pet Sematary. 4. Favorite Halloween candy? Airheads, or Skittles, or Dots! 5. What YA horror/thriller would you recommend? 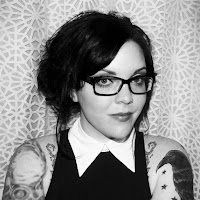 Bleeding Earth by Kaitlin Ward comes out February of next year and it is FANTASTIC! Amy Lukavics lurks within the forested mountains of Prescott, Arizona, along with her husband and two precious squidlings. When she isn't reading or writing creepy stories, she enjoys cooking, crafting and playing many video games. Daughters unto Devils is her debut novel. I love that this book is also historical fiction!! How exciting! Historical fiction + horror story = overly CREEPY!! All in all, the description creeps me out but also makes me want to read the book pretty badly. @Anna how would you answer question 1 of the Fast Five?